Well his (RED) thing is a bust. Big surprise. I told him, Look, you need to run a huge ad campaign to build awareness. Of course he’s too cheap for that. He’s like, Ah, no, Steve, I’ll just use me fookin star power to get loads of interviews. Right. Friggin leprechaun. As of year-end they raked in a whopping $11 million. Ugh. Other thing I told him is if you’re gonna crusade for the Nobel Prize, you gotta be subtle about it. And you gotta at least pretend to care about whatever cause you’re doing. Look at Al Gore. You listen to that guy and you’d really think he believes in this global warming stuff. Very convincing. 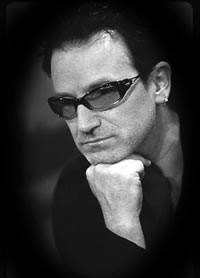 Bono, you’re my pal, so take this the right way. You should Stick to music.